Winner of the 2014 Pulitzer Prize for drama and the 2013 Obie Award for playwriting, the play is set in an ailing cinema and follows three underpaid movie ushers, Avery, Sam and Rose. The Aux Dog Theatre Nob Hill is pleased to present the Southwest Premiere of Annie Baker’s play The Flick, directed by Justin Golding. The Flick opens March 22 and runs through April 14. All opening weekend tickets are $10. Curtain is 8:00pm for Friday and Saturday shows. Sunday matinees are at 2:00pm. 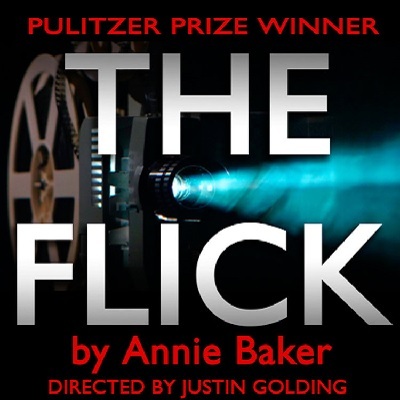 Winner of the 2014 Pulitzer Prize for Drama and the 2013 Obie Award Playwriting, The Flick is set in an ailing cinema in Massachusetts, and follows three underpaid movie ushers, Avery, Sam and Rose (who also runs the film projector). The staging reverses the traditional theatrical polarities: the audience will be seated on the Aux Dog stage and the action will take place in the house of the theatre. A comedy of the mundane, it is a play full of almost Chekhovian yearning and disappointment. It also plays cleverly with the idea that a film takes us completely out of ourselves and raises questions about reproduction and authenticity and the nature of the live and lived experiences. The Flick is a comedy about a minimum wage crew working in an old 35mm movie theater in Massachusetts. But here’s the twist, you are seated on the stage, and they are out in the seats doing their (comedic acting) jobs sweeping up popcorn, selling tickets and running the projector. Tickets are $20 and seating is very limited (because you will be on the stage on what I have been assured are comfortable, cushioned chairs). The shows run for the next two weeks on Fridays and Saturdays at 8pm, with 2pm matinees on Sundays at Aux Dog Theater Nob Hill (3011 Monte Vista Blvd NE). For more information see auxdogtheatre.org.